We found Rick to be both helpful and knowledgeable in design decisions and formulating an efficient plan for our garage space. Rick gave us a number of ideas that we had not considered and that worked well for our garage. His work kept on schedule and our end result was fantastic. 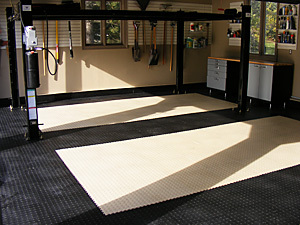 We would recommend Nuvo Garage and Rick to anyone considering a garage renovation!! 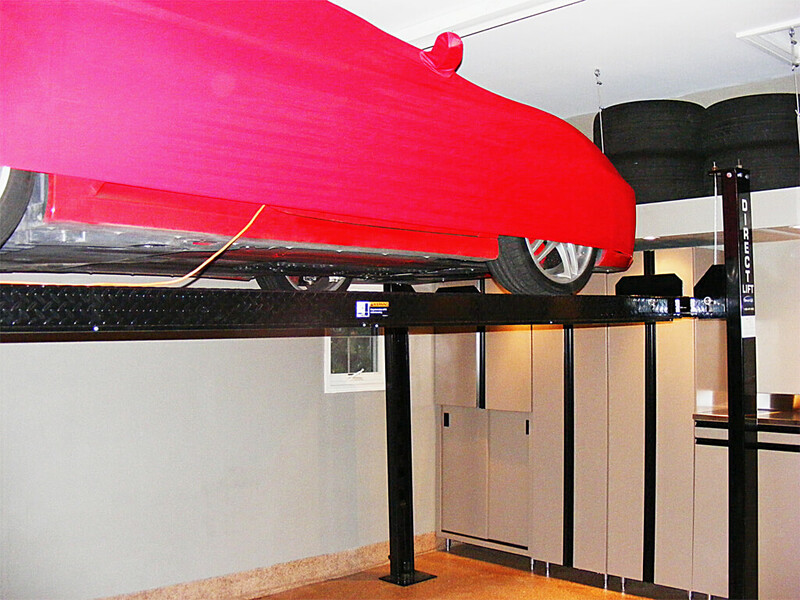 A recent client in Aurora came to Nuvo Garage with a situation that prompts many of our clients to call us: a garage that wasn’t filling their needs. 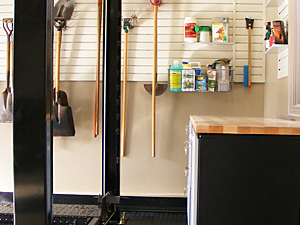 This couple had a three-car garage in which they wanted to store four vehicles as well as gardening equipment, bicycles and install a work bench. The garage was cluttered, messy and only partially organized. There were a few hooks for garden tools, but it was rudimentary. What was unusual about the situation is that storing all four vehicles in their garage wasn’t their top priority – they were resigned to storing one of their vehicles off-site. 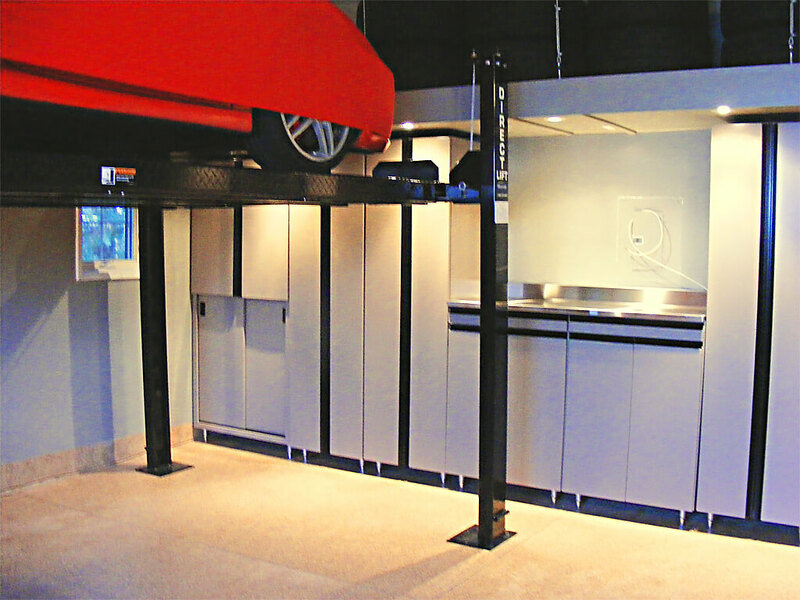 The priority was a garage that matched their needs for both storage and aesthetics. My goal was to give them the garage they needed with the finishes they wanted plus storage for all four vehicles within their budget. I believed that getting the sports car up was the key to making the three car garage more functional. Organizing four cars, gardening equipment, two bicycles, seasonal decorations and equipment and building a work bench was not impossible, but it was a challenge. We started by figuring out what their storage needs were and how the garage could be best configured to suit these needs. One of their requests was that everything be stored behind closed doors. Of particular importance was a unit that kept the garbage out of site. 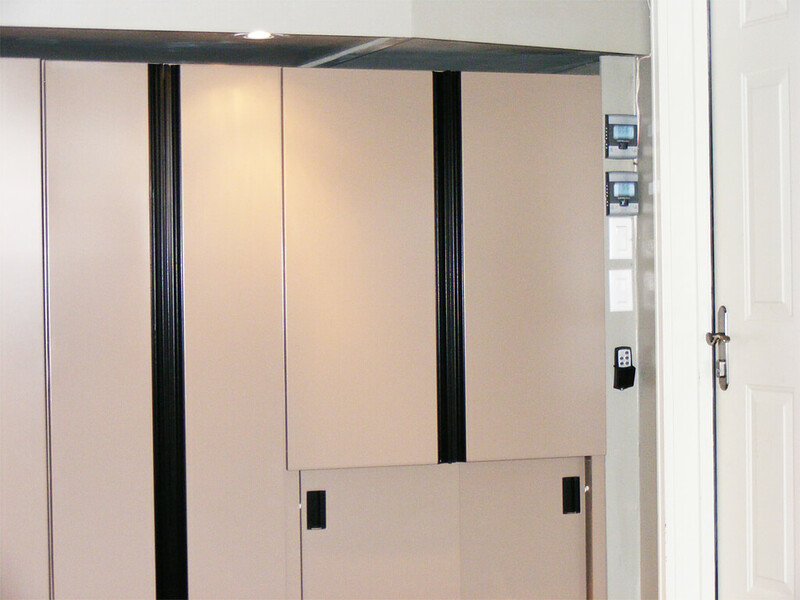 We gave them an Onex cabinet that had doors on both the top and the front, which allowed them to easily deposit garbage in the bins and then roll them out when needed. This now sits beside a shelving unit that was built to hold recycling bins. A bin for organics hangs on a hook beside this, keeping it off the floor but allowing for easy access. 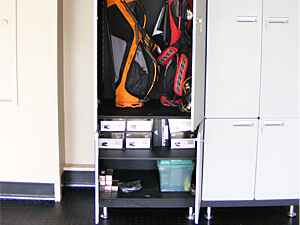 Their other special requests included a golf locker to house their equipment and a custom enclosure for their electrical panel box (which had to be built to code), a stainless steel sink and counter. Two overhead storage racks offered the perfect solution for their seasonal decorations and equipment. We installed slatwall on the left and right walls as well as the back of the first bay to hold a range of lockable hooks and baskets for storage of bicycles and gardening equipment. A few quick measurements revealed that although they had a centre mechanism for their garage door, the ceiling height would allow for a four post lift. We replaced the centre mechanism with a jack shaft to clear up the ceiling in the centre of the bay, which gave us room for a four-post lift. They could now park all four vehicles in their garage! The finishings were important because aesthetics was a priority for this couple. You’ll see from the photos that everything in the garage has been finished, including the framing of windows and doors. You don’t typically see garage doors and windows framed like those in a house, but this couple wanted the level of the finishes in the garage to be the same quality that you see in their house. The floor is covered with PVC tiles in black and tan, which are sharp and decorative and outline the bays quite nicely while complementing the colour of the cabinets. The PVC tiles are easy to maintain and clean and cut down on dust. The job took approximately one week and cost $35,000.